At WWDC this morning, Apple previewed watchOS 5, the newest version of the Apple Watch operating system. The update adds a number of new fitness and communications features that Apple says will help Watch owners "stay healthy and connected." Auto-workout detection is a major quality of life improvement for those who use their Apple Watch devices for fitness. 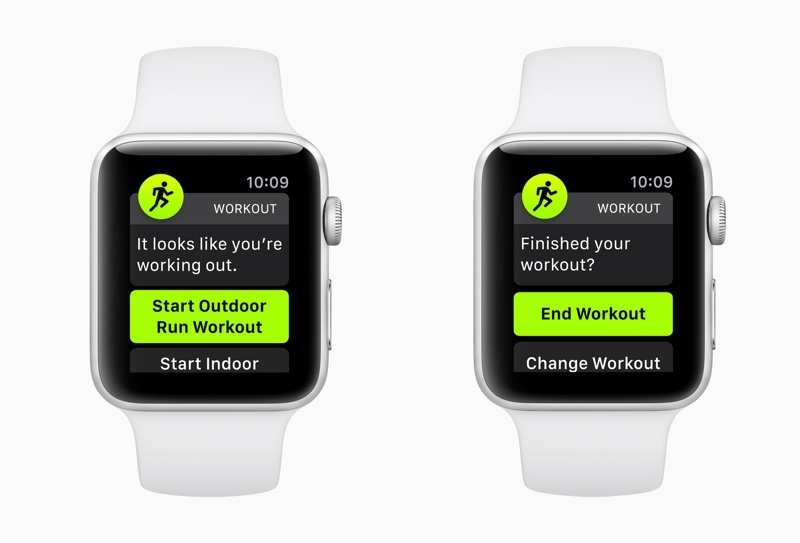 In watchOS 4 and prior versions, users needed to manually begin a workout in the Workout app — and failing to do so meant missing out on tracking and other data related to their workout. watchOS 5 will use heart rate and movement data to determine if the user might be working out, and pop up an alert to the user to start the workout and even give retroactive credit to the start of the workout. It will also prompt users to end workout sessions if the user forgets to turn the app off. Also new is an "activity competition" mode, that will allow fitness-focused friends to challenge each other to seven-day competitions, with users getting points for closing activity rings over the course of a week. Smack talk and achievements are, naturally, tightly integrated. Yoga and hiking have been added to the types of workouts supported, taking into account elevation change and heart rate to accurate measure calories burned and total exercise minutes. 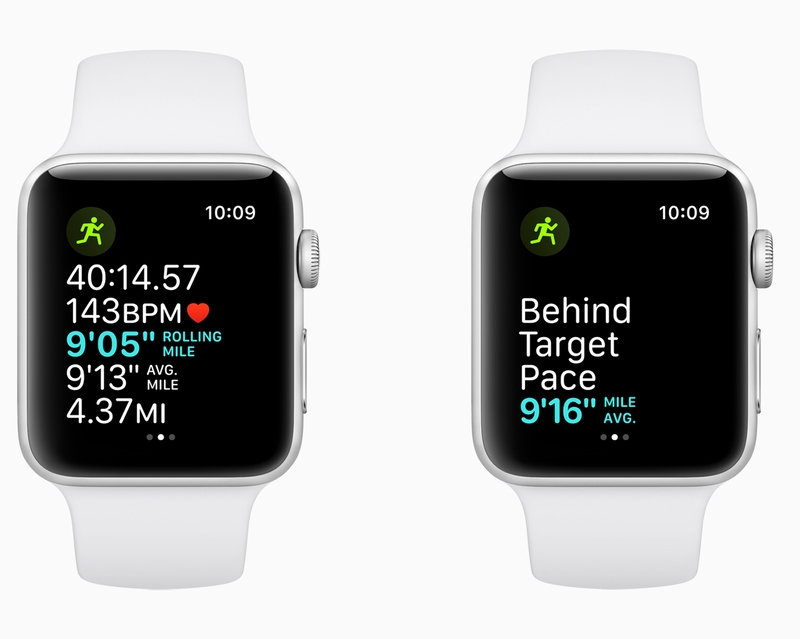 Runners have received a number of new features that will help keep them on track. A cadence or steps-per-minute metric that works on both indoor and outdoor runs has been added, and outdoor runners gain a new pace alarm that alerts if they are ahead of or behind a target pace. Finally, a rolling mile pace shows the pace for the immediately preceding mile, on top of the current and average pace displays. A new Walkie-Talkie app lets users send push-to-talk messages (like an old-school Nextel phone) to each other from watch-to-watch, and a new Podcasts app has been added as well. That will allow subscribed podcasts to automatically sync to the device for offline listening, and music and audiobooks from apps like Pandora and Audible will sync to the Apple Watch for offline playback as well. The Siri watch face has been updated with better shortcuts and suggestions, including sports scores or commute time ahead of your drive home. And actions for supported third-party apps will show up as well. Finally, the Apple Watch will support on-device Student ID cards, allowing students access to buildings, to pay for food and laundry on campus, and more. It's supported by a number of major universities at launch including Duke, the University of Alabama, and the University of Oklahoma this fall, with others — including Johns Hopkins and Temple University — offering support by the end of the year. Apple also released a new rainbow-colored Pride watch band and watch face, which is available today. watchOS 5 is expected to be released later this fall. Still no custom watch faces, that's pretty sad Apple, pretty sad. I am SOOOO Annoyed with Apple. I LOVE my Apple Watch, but the watch faces need a major refresh and not Buzz Lightyear. I want them to make creative watch face that professionals will love to have on their wrist. It is not a Childs toy. Please apple, help those of us out who love it as a watch first and everything else after. I forgot about the automatic workout detection stuff. That to me is one of the best new features. There are so many times that I'll be a mile into a walk/run before I remember to start it, or I'll be sitting inside an hour later and realize my Watch is still going and collecting data and I get undeserved achievements for having a long exercise even though I wasn't. The competition stuff is also neat. Walkie talkie mode is my next favorite feature. Being able to quickly hit up my wife on the weekend while running around doing errands is going to be great. I just hope we have control over when Walkie Talkie mode is active, such as only when I'm not at work, etc. My wife doesn't yet have an Apple Watch, but perhaps some of these new features will persuade her to let me buy her one this autumn. Her FitBit has been giving her fits (hah) and so this might be the time to lure her over. Her main problem is she hasn't much cared for the look of the Watch. I love how Apple keeps improving Activity and Workout. I find Apple Watch to be the best fitness-companion already and they just keep on improving it. Heck, raising your wrist and just talking to Siri without the need for Hey Siri is going to make this upgrade. Automated workouts alone makes this upgrade. Article should note from the Apple press release, that Series 0 is not supported. 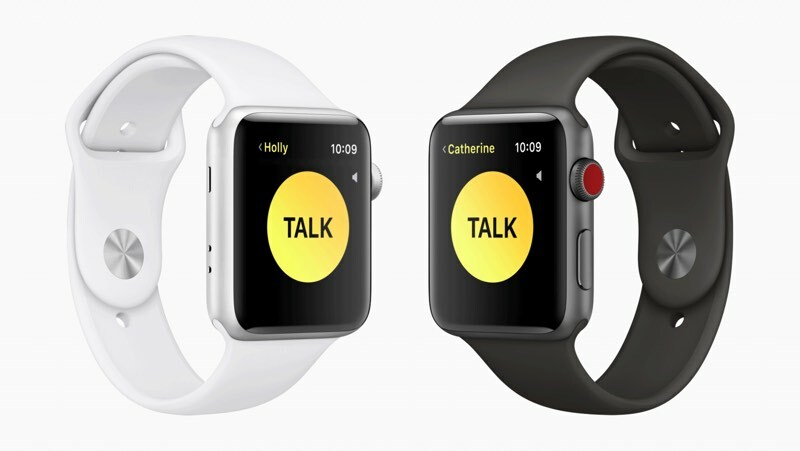 * watchOS 5 will be available this fall as a free update for Apple Watch Series 1 and later and requires iPhone 5s or later on iOS 12. watchOS 5 will not be available on the original Apple Watch. Features are subject to change. Some features may not be available in all regions. The whole daily activity/exercise/calorie goal need a re-design. Its one of the few things I feel doesn't really work on my Apple Watch. I love the Apple Watch. I have tried Fitbit, Garmin and Samsung and I find the Apple Watch to just be better in pretty much every possible way. And Apple keeps on improving the Activity and Workout-app at phase that no one else seems to be even close to match. But I fully agree. The whole approach to daily goals feels somewhat awkward to me. Having this set amount of calories and exercise mirrored and identical for every single day doesn’t make much sense. I don’t plan exercises for every single day, and no one really should unless they count things like walking for 30 minutes as a exercise.. If I was going to do my exercises every single day it would not be good for my body..
What does this result into? Well, it makes it impossible for me to set activity goals on the watch. Either I have to set a low calorie goal so watchOS won’t be nagging me all day for the days I’m not exercising and completely demolish said goal every day I actually do exercise or I have to set a more realistic goal, something more close to my average daily calorie goal but then have watchOS counting all days without exercises as "fails"… Its rather annoying… And it doesn’t really help motivate or anything when its done in the way its currently working. They could let proper watch companies sell faces. Wonder if this works on watch cellular though?